It’s a tale as old as time. No, not Beauty and the Beast. We are talking about wood vs. vinyl. 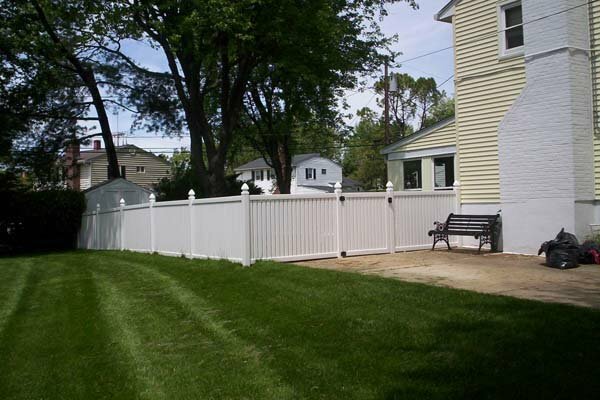 More specifically, which is better for homes in Arnold, Maryland, a Wood Privacy Fence or Vinyl Privacy Fence? Unfortunately, there is no right answer; both fencing options have their pros and their cons. The secret to choosing the right fence for your property is to research those pros and cons and determine which fence material makes the most sense for your needs. Wood fences are still the most affordable fences on the market. But more than that, wood fences come in many different styles, providing a range of looks sure to suit any homeowner. Of course, wood fences also have a few drawbacks, primarily maintenance. These fences require yearly maintenance: cleaning, repairs, and painting or staining. They can also be susceptible to termites, wood rot, and warping if not properly maintained. The return on investment for a wood privacy fence in Arnold, Maryland is about 50%. Initially, the cost of vinyl fencing is greater than that of wood fencing, but you’ll save money in the long term because of two things: a long lifespan and minimal maintenance. There is no painting, no staining, and only the occasional cleaning. The return on investment for a vinyl privacy fence in Arnold, Maryland is about 65%. With 40 years of experience behind us, Freedom Fence and Home provides the highest quality vinyl fencing installation in the Bel Air area and beyond. Our fencing experts are available to help homeowners and business owners select the right design and materials for their fencing project. We are licensed and insured in the state of Maryland and our record of zero complaints with the Maryland Home improvement commission and the better business bureau speaks for itself. In the meantime, if you have any questions about which makes the most sense for you, a Wood Privacy Fence or a Vinyl Privacy Fence, please contact Freedom Fence and Home by calling 443-271-6841 or visit our website. You can also follow us on Facebook and Twitter! This entry was posted on Tuesday, March 10th, 2015	at 12:53 pm	. Both comments and pings are currently closed.